"It is a country full of evergreen trees, of mossy silver birches and watery maples, the ground dotted with insipid, small red berries, and strewn with damp and moss-grown rocks a country diversified with innumerable lakes and rapid streams, peopled with trout and various species of leucisci, with salmon, shad and pickerel, and other fishes; the forest resounding at rare intervals with the note of the chicadee, the blue-jay, and the woodpecker, the scream of the fish-hawk and the eagle, the laugh of the loon, and the whistle of ducks along the solitary streams; and at night, with the hooting of owls and howling of wolves; in summer, swarming with myriads of black flies and mosquitoes, more formidable than wolves to the white man. Such is the home of the moose, the bear, the caribou, the wolf, the beaver, and the Indian." 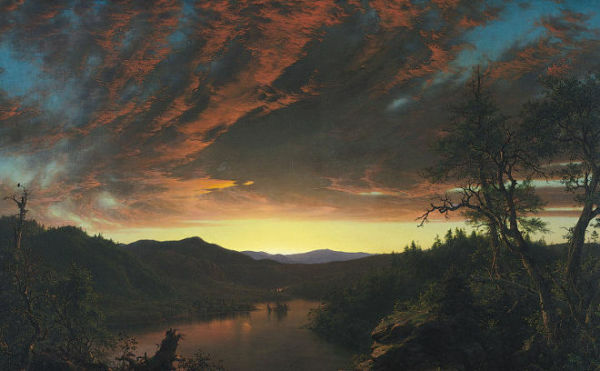 That magnificent landscape above was painted by Frederic Church.